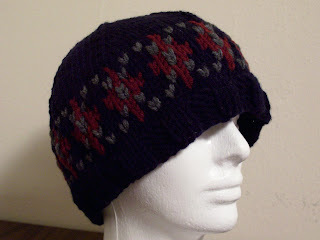 Note: This pattern first creates a navy cap with claret diamonds. Then the diagonal charcoal lines are added with duplicate stitch. Cast on 66 (72, 78) sts with Navy on circ. Join to work in the rnd, being careful not to twist. Rnds 1-5: [k3, p3] around. Rnds 8-9: [k3Navy, k1Claret, k2Navy] around. Rnds 10-11: [k2N, k3C, k1N] around. Rnds 12-13: [k1N, k5C] around. Rnds 14-15: same as Rnds 10-11. Rnds 16-17: same as Rnds 8-9. With Navy, knit 1 (2, 3) rnds. Rnd 1: [k9 (10, 11), k2tog] 6 times – 60 (66, 72) sts. Rnd 2 & all even rnds: knit even. Rnd 3: [k8 (9, 10), k2tog] 6 times – 54 (60, 66) sts. Rnd 5: [k7 (8, 9), k2tog] 6 times – 48 (54, 60) sts. Continue to dec 6 sts every other rnd until 24 sts rem. Next rnd: knit even. Next rnd: k2tog around – 12 sts. Next rnd: knit even. Next rnd: k2tog around – 6 sts. Cut yarn and thread through rem loops using tapestry needle. Pull tight and tie off. Use tapestry needle and Charcoal yarn to duplicate stitch diagonal lines according to chart. Weave in ends. CO 42 (48, 54) sts on circ. Join to work in the rnd, being careful not to twist. Rnds 1, 2, 3, 5, 6: *p3 (4, 5), k4*; rep between *s around. Rnd 4: *p3 (4, 5), FC4*; rep between *s around. Rep Rnds 1-6 once more. Adult Small Size Only: Repeat Rnds 1-2 once more. Adult Large Size Only: Repeat Rnds 1-4 once more. Rnd 1: *p2 (3, 4), k2tog, k3*; rep between *s around - 36 (42, 48) sts. Rnd 2: *p2 (3, 4), k4 (FC4, k4)*; rep between *s around. Rnd 3: *p1 (2, 3), k2tog, k3*; rep between *s around - 30 (36, 42) sts. Rnd 4: *p1 (2, 3), FC4 (k4, k4)*; rep between *s around. Rnd 5: *p0 (1, 2), k2tog, k3*; rep between *s around - 24 (30, 36) sts. Rnd 6: *p0 (1, 2), k4 (k4, FC4)*; rep between *s around. Rnd 7: *p_ (0, 1), k2tog, k3*; rep between *s around - _ (24, 30) sts. Rnd 8: *p_ (0, 1), _ (FC4, k4)*; rep between *s around. Rnd 9: *k2tog, k3*; rep between *s around - _ (_, 24) sts. Rnd 11: k2tog 12 times - 12 sts. Rnd 13: k2tog 6 times - 6 sts. Cut yarn and thread tail through rem sts using tapestry needle. Pull tight and tie off. Weave in ends. Feel free to comment with questions. Who wouldn't prefer a cute little stocking filled with candy to a boring greeting card? Whether you're a broke college student or have relatives who aren't worth the price of a "real" gift, these little guys are the perfect solution to large family holiday get-togethers where no one should feel left out. Knit one for everyone and fill with half a dozen chocolate kisses. Make a few extra for unexpected guests. With cuff color, CO 18 sts and dist to 3 dpns. Join to work in the rnd, being careful not to twist. Work 3 rnds in seed stitch ([k1, p1] on odd rnds, [p1, k1] on even rnds). Change colors if desired. Do not cut previous color; just carry it along inside stocking until it is needed again. 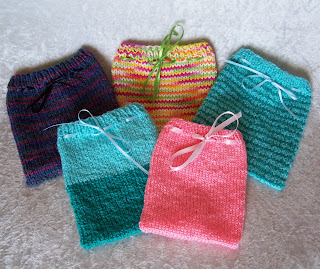 Knit 15 rnds in stst. For striped version, change colors every two rounds. Redistribute sts so that 9 are on one needle for heel. Row 1: With heel color, k8, turn. Row 2: yo-b, p7, turn. Row 3: yo, k6, turn. Row 4: yo-b, p5, turn. Row 5: yo, k5, am, k2tog, turn. Row 6: yo-b, p6, ssp, turn. Row 7: yo, k7, am2, k3tog, turn. Row 8: yo-b, p8, sssp, turn. With main color (or stripe pattern), yo, k9, move next yo to next needle & k2tog, k7, move next yo (first st on next needle) to end of current needle & skp. Knit even for 4 rnds. Knit 4 more sts; this is the new beg of each rnd (so the color joggle is on the bottom of the foot). Cut main color. With toe color, knit 1 rnd even. Next rnd, [k1, k2tog] around (12 sts) - you may have to redistribute sts on needles for the k2tog's. Next rnd, [k2tog] around (6 sts). Cut yarn, leaving a tail. Thread through rem sts using tapestry needle. Pull tight and tie off. Weave in ends. Fill with candy, potpourri, etc. Add a ribbon loop to the top to use as a tree ornament. Do whatever you want with it! EDIT: Okay, guys. That's enough. I'm flattered. Really. But no more. Not for now at least. Those of you whom I have already contacted, don't worry. Anyone seeing this for the first time, I'm sorry. No more custom orders. 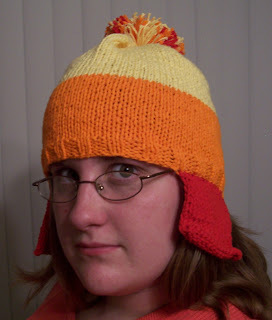 I can't knit the same hat over and over again for the rest of my life. If you would like to leave your email, I will put you on a waiting list and contact you when and if I can stand to look at blue and grey yarn ever again. 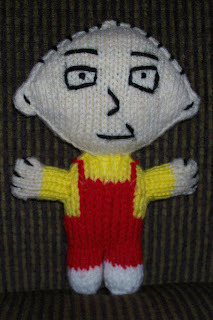 In the meantime, I recommend you try to find a knitter near you or even learn to knit yourself. It's a great hobby.I never expected a little hat I made for my nephew's Halloween costume would draw so much attention. Thank you all for your interest and appreciation. 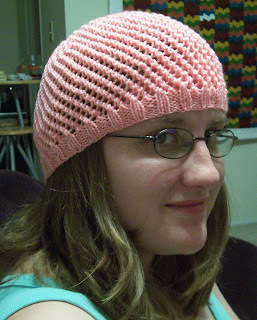 Note: This pattern is written such that a basic striped hat is created first, and then details are added with duplicate stitch afterward. If you prefer, you can use the appropriate chart and stranded knitting for rounds 8-12 (9-14, 10-15) and rounds 25-30 (28-33, 30-35), leaving less duplicate stitching to be done in the end. 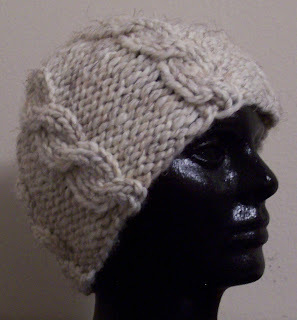 With grey yarn and circular needles, CO 84 (96, 108) sts. Join to work in the rnd, being careful not to twist. Work 4 (5, 5) rnds in k2, p2 ribbing. Join blue, but do not cut grey. With blue, knit 2 (2, 3) rnds in stst. Twist blue and grey strands once to prevent a hole. Knit 1 (1, 1) rnd in grey. Twist strands and knit 5 (6, 6) rnds in blue. Twist strands and knit 8 (9, 10) rnds in grey, twisting strands every 4 (5, 5) rnds to carry blue strand along, but still working with grey. Switch to dpns with 28 (32, 36) sts on each of 3 needles. Rnd 1: With grey, [k6 (7, 8), k2tog, k6 (7, 8)] around - 78 (90, 102) sts. Rnd 2 and all even rnds: knit even with same color as previous rnd. Rnd 3: With grey, [k6 (7, 8), ssk, k5 (6, 7)] around - 72 (84, 96) sts. Rnd 5: With blue, [k5 (6, 7), k2tog, k5 (6, 7)] around - 66 (78, 90) sts. Rnd 7: With blue, [k5 (6, 7), ssk, k4 (5, 6)] around - 60 (72, 84) sts. Rnd 9: With blue, [k4 (5, 6), k2tog, k4 (5, 6)] around - 54 (66, 78) sts. Rnd 11: With grey, [k4 (5, 6), ssk, k3 (4, 5)] around - 48 (60, 72) sts. Rnd 13: With blue, [k3 (4, 5), k2tog, k3 (4, 5)] around - 42 (54, 66) sts. Rnd 15: With grey, [k3 (4, 5), ssk, k2 (3, 4)] around - 36 (48, 60) sts. Rnd 17: With grey, [k2 (3, 4), k2tog, k2 (3, 4)] around - 30 (42, 54) sts. Rnd 19: With grey, [k2 (3, 4), ssk, k1 (2, 3)] around - 24 (36, 48) sts. Rnd 21: With grey, [k2tog] around - 12 sts. Rnd 22: With grey, knit even. Rnd 21: With grey, [k2, k2tog, k2] around - 30 sts. Rnd 23: With grey, [k2, ssk, k1] around - 24 sts. Rnd 25: With grey, [k2tog] around - 12 sts. Rnd 26: With grey, knit even. Rnd 21: With grey, [k3, k2tog, k3] around - 42 sts. Rnd 25: With grey, [k2, k2tog, k2] around - 30 sts. Rnd 27: With grey, [k2, ssk, k1] around - 24 sts. Rnd 29: With grey, [k2tog] around - 12 sts. Rnd 30: With grey, knit even. 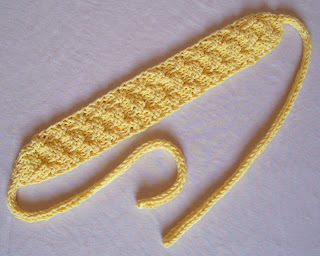 All Sizes: Cut yarn and thread tail through rem sts using tapestry needle. Pull tight and tie off. Weave in ends. Using tapestry needle and duplicate stitch method, add details to match appropriate chart below. With grey, CO 12 sts leaving a long tail. Dist sts to 3 dpns - 4 sts on each needle. Knit 7 rnds in stst. Join black and cut grey. Next rnd, [k2tog] around – 6 sts. Next rnd, [k2tog] around – 3 sts. Cut yarn and thread through rem sts using tapestry needle. 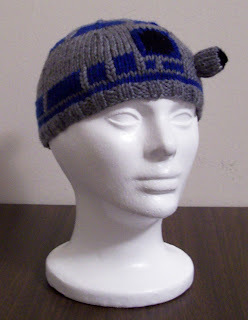 Stuff with batting and use tapestry needle and CO tail to sew to hat along dashed lines from chart. Weave in ends. 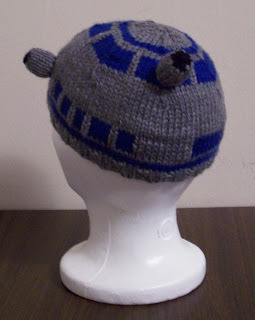 Put on hat and make beeping noises. With orange yarn and circ, CO 60 (72, 84) sts. Join to work in the rnd, being careful not to twist. Work 4 (4, 5) rnds in k2,p2 ribbing. Knit 11 (13, 15) rnds in stst. Join yellow and cut orange. Knit 14 (17, 20) rnds in stst. Switch to dpns with 20 (24, 28) sts on each of 3 needles. Rnd 1: [k8 (10, 12), k2tog] around - 54 (66, 78) sts. Rnd 2: [k7 (9, 11), k2tog] around - 48 (60, 72) sts. Rnd 3: [k6 (8, 10), k2tog] around - 42 (54, 66) sts. 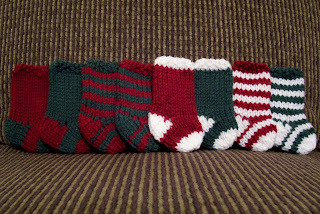 Cont to dec 6 sts each rnd until 36 sts rem for all sizes. Next rnd, [k1, k2tog] around - 24 sts. Next rnd, [k2tog] around - 12 sts. Next rnd, [k2tog] around - 6 sts. Cut yarn and thread through rem loops using tapestry needle. Pull tight and tie off. With red yarn and using one dpn, pick up 13 (15, 17) sts along ribbed edge wherever you like with RS facing, turn. Row 1: sl1, p11 (13, 15), k1. Row 2: sl1, k12 (14, 16).Rep last two rows 7 (8, 9) more times. BO all sts. Rep for second earflap on opposite side. Weave in ends. Make a pom-pom with all three colors and attach to top of hat. Go be a big damn hero.